Li & Fung has become one of the world's largest producers of consumer goods, and the company only keeps growing. Collaboration is never easy. Here Fortune salutes the teams who make hard work look as smooth as silk. Photographs by Ben Baker. NEW YORK (Fortune) -- On the morning of Sept. 11, 2001, William Fung, the CEO of Li & Fung Limited, a large Hong Kong-based sourcing company founded by his grandfather, awoke in his Boston hotel room with an inexplicable urge to meet his sister, who lives in San Francisco, for lunch at their favorite sushi restaurant there. Fung was booked on United Airlines Flight 175, which was scheduled to leave Logan International Airport at 8:00 a.m. that morning for Los Angeles. At the last minute, he changed planes and boarded one bound for San Francisco instead. The sushi craving saved his life. Terrorists hijacked the United flight and flew it into the World Trade Center. William chalks up his good fortune to fate and the benevolent deeds of his ancestors. "The Chinese believe that if you do good, you'll be rewarded," he says. Fate also saved his father's life. At the end of World War II, a Japanese soldier stumbled into Fung Hon-chu's Hong Kong office waiving a pistol. Before he could do much harm, the soldier, who was drunk, quickly staggered out. Just as this skein of good karma threads through the Fung family, so too has Li & Fung built its business around an invisible chain. The company quietly has become one of the world's largest producers of consumer goods -- including Cannon sheets, Tommy Hilfiger polo shirts, Restoration Hardware bathroom faucets, L'Oreal cosmetics and Hello Kitty stuffed animals -- all without owning a single factory or fabric mill. Sales, which grew sevenfold over the past decade, totaled $14.3 billion in 2008. One third is hard goods; the rest is apparel. All told, Li & Fung produced more clothing last year than the apparel exported by Thailand, South Korea, and Malaysia combined. "Their size is their competitive advantage," says J.P. Morgan analyst Vineet Sharma. "They are just so much bigger than any of their competitors." And Li & Fung is growing -- fast. Like a giant squid, the company has been gobbling direct rivals and ancillary businesses in an attempt to reach its goal of $20 billion in sales by 2010. Armed with a $1 billion war chest, Li & Fung has, in the past year, acquired a British footwear company, a manufacturer of technical gear for Nike (NKE, Fortune 500) and a major handbag maker as well as the in-house sourcing divisions of Liz Claiborne (LIZ) and Talbots (TLB). In October, Li & Fung announced its latest prize: Wear Me Apparel, a maker of clothing for companies such as Calvin Klein, Timberland (TBL), and Hurley. The acquisition strengthens a recently launched U.S. division that -- instead of just sourcing -- owns and licenses brands outright. The new business model gives Li & Fung even more control over the supply chain -- but also potentially thrusts the company into direct competition with its customers. At the same time, Li & Fung continues to expand its sourcing network by forging into new markets such as Latin America and Africa, which it believes could one day replace China as the world's low-cost maker of consumer goods. Li & Fung's tentacles are also spreading into financing. The company has become a lender of last resort to factories and small importers, whose credit was cut off during the global financial meltdown. In the wake of commercial lender CIT Group's bankruptcy filing last month, Li & Fung stands to pick up even more market share -- one reason why Bank of America Merrill Lynch analyst Denise Chai rates the stock, which has more than doubled to $4.20 (HK$32.70) in the past year, a "buy." Here's how Li & Fung spins its gossamer web: The company works with large, mostly Western apparel manufacturers and retailers -- Wal-Mart (WMT, Fortune 500) and Target (TGT, Fortune 500) are among its largest clients -- to develop the specifications for a particular garment, including the fabric weight, dye shade, and the finish and style of trim. Then it goes on a giant shopping spree, first plugging those coordinates into a computer database of 15,000 suppliers, and then once the pool of potential manufacturers is narrowed sufficiently, sending an army of managers -- known internally as "Little John Waynes" -- into the field to personally negotiate prices and inspect quality. Li & Fung Limited is just one part of a vast Fungian empire that includes hundreds of Circle K and Toys R Us stores in Asia. Other Fung-backed companies hold the licenses to sell Calvin Klein underwear, Gant shirts, and Cerruti suits in the region. The Fungs control these businesses through a private investment firm called Li & Fung 1937, named for the year the company moved its headquarters to Hong Kong from mainland China. Unlike other companies on the fast track, Li & Fung prefers to keep a low profile. William, 60, and his brother, Victor, 63, who serves as group chairman, are both Harvard educated and live discreetly in an apartment building they own on Magazine Gap Road, which winds through Hong Kong's exclusive Peak district. Each brother has his own floor, and their mother, 90, lives in the penthouse. When their friends were all buying fancy yachts, they were content with a locally made 75-foot wooden powerboat their father had bought in 1985 called Tradewind. Their one indulgence: villas they are building in Phuket, Thailand. "You'd never know they were billionaires," says Allan Zeman, a Hong Kong businessman and longtime associate. Says fashion designer Vera Wang, who has known the Fungs for 40 years: "They're so quiet and subterranean, yet so powerful. They are one of the great Chinese Dynasties." Buried in the archives at Li & Fung's Kowloon headquarters, in Hong Kong's old manufacturing district, is a photograph of founder Fung Pak-liu, taken at the 1915 World's Fair in San Francisco. The grainy black and white image is striking: Fung Pak-liu is seated dead center, surrounded by a sea of Westerners. From its earliest days, Li & Fung has always served as a bridge between East and West. In 1906, when Fung Pak-liu and partner Li To-ming --their respective names mean "profit" and "plentiful" in Cantonese -- opened a small trading firm in the southwestern Chinese city of Guangzhou, relations between the two cultures were raw. Only six years earlier, an eight-nation Western alliance had marched into Beijing to quash the Boxer Rebellion, a Chinese uprising against foreign influence. In Guangzhou, the British and French had commandeered a small island in the middle of the Whampoa River where all foreign trading firms were located. Chinese companies like Li & Fung were forbidden from operating on the island. Fung Pak-liu quickly overcame that hurdle. As a former schoolteacher, he spoke fluent English, which allowed him to act as an intermediary between the Chinese factory owners and Western buyers. Li & Fung flourished as an exporter of porcelain, silk, fireworks, and rattan wares. Li To-Ming sold his stake to the Fungs in 1946. To groom Victor and William as future heirs, their father packed them off to American universities -- William to Princeton, Victor to M.I.T. and both eventually to graduate school at Harvard, where Victor later taught economics. In the spring of 1972, the boys got a call from their mother. She said: "One of you better come back and help your dad, because he's killing himself working." When they returned, they sold off secondary businesses and took the company public, then bought out the stockholders in a 1989 management buyout and relisted on the Hong Kong stock exchange in 1992. Since then the stock has returned 9,958%, compared with a 250% return for the Hang Seng index. 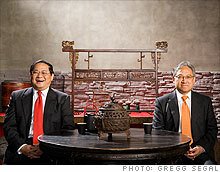 Today, Victor and William each hold 17% of the publicly traded Li & Fung Limited, worth roughly $2.8 billion apiece. To relax, William practices Feng Shui, the Chinese system of balancing energies to create good fortune. When I met him in a conference room at his company's headquarters, he insisted on changing seats with me to avoid sitting with his back to the door, which he says is bad luck. "If you cut out the business school veneer, there are some things about us that are very traditional," he says. That counterpoint between East and West threads through the company -- right into the executive suite. An unusual triumvirate makes all company decisions. On the one hand are Victor and William. On the other is Li & Fung's president -- an American former tennis pro named Bruce Rockowitz. With his blond hair and bronzed skin, Rockowitz, 50, looks like a B-grade Steve McQueen, and his manner, unlike the slight bookishness of the Fungs, is easygoing and sociable. He runs a chain of trendy restaurants and health clubs that are unrelated to Li & Fung and is engaged to the Chinese pop star Coco Li. Rockowitz wound up in Hong Kong almost by accident. After dropping out of the University of Vermont at the end of his sophomore year, he traveled the world playing professional tennis before landing a job as the head pro of the Hong Kong Country Club. In between groundstrokes, he befriended another Western expatriate, a Canadian named Allan Zeman. Together they started Colby, a rival to Li & Fung. When Li & Fung bought Colby in 2000, Rockowitz stayed with the company. He is the only non-Fung to hold such a senior management position. "I fill the gap between Victor and William and the next generation," Rockowitz told me over a lunch of tofu and noodles at Red, one of his restaurants. Next in line is Spencer Theodore, 35, and Terence, 29, who serve as executive director and vice president of corporate services respectively and are being groomed to run the company. Of all the Fungs, Victor is perhaps the most tireless. His outward serenity masks a boundless energy. "You never see Victor frustrated -- on or off the tennis court," says Rockowitz of his former pupil. Once, when a management meeting that lasted from breakfast until 2 a.m. broke up, all the other executives headed home, but Victor wanted to go for noodles. During my stay in Hong Kong, I spent Saturday afternoon walking around the Landmark, a luxury shopping mall, where I bumped into Victor. Clad in a suit, he was heading to a meeting. Victor, who handed off daily responsibilities of Li & Fung Limited to his brother in 1986 and went on to found Prudential Asia Investments, spends most of his time today on international trade issues. One of those issues is the migration of low-cost production from country to country, a process that started more than 30 years ago and has accelerated. Back in the 1970s, rising labor costs in Hong Kong forced Li & Fung to open an office in neighboring Taiwan, but it wasn't long before an employee in the Taiwan office told William, "Everything is moving to Korea." Pretty soon the Koreans were lamenting that they couldn't keep up with low-cost Thai production and the Thais were complaining about the Indonesians. Then, in 1979, when China opened its economy, "everyone threw up their hands in despair," William says. How could they compete with the massive low-cost labor of the Chinese? Production didn't jump from country to country all at once. The most labor-intensive jobs moved first, eventually splicing manufacturing across the globe like a giant ameba and giving rise to the modern supply chain, or what Victor calls borderless manufacturing. Today, Li & Fung sources in 45 countries, up from 13 in 1994. "We dissect the chain and put it back together again," Victor says. "Competition is no longer company against company. It's network against network." As the chain became more complicated, Li & Fung rode a tidal wave of outsourcing, and, along the way, snapped up most of its major competitors, starting with the purchase of IBS in 1995, then Colby in 2000. "Li & Fung has an incredible amount of buying power, says Fred Gehring, the CEO of Tommy Hilfiger. "When they go to a factory and place orders, they get better clout than if we went on our own." Says Liz Claiborne CEO William McComb: "They are the Wal-Mart of purchasing. There isn't even a close No. 2." That dominance worries some of Li & Fung's business partners, who complain that the company's monopoly position drives up prices and creates conflicts of interest. Several factory executives told Fortune that Li & Fung adds costs to the supply chain. It would be cheaper, they say, to bypass Li & Fung and sell directly to retailers. One factory owner, who used to work directly with Liz Claiborne, says her costs have increased since Liz sold its sourcing arm. The difference: a 5% fee she pays to Li & Fung. Sometimes that extra cost comes out of the quality of the merchandise. Another factory owner says that instead of making a $5 shirt, he makes one for $4.75 using lesser materials. This way, he can give Li & Fung its cut and still capture the same profit. "Li & Fung," he says, "has gotten too big and too greedy." Li & Fung says all fees are fully disclosed to its clients and include financing, product development, and product liability costs. The retailers I spoke to seemed happy with their Li & Fung arrangement. To keep growing, Li & Fung is expanding into new businesses, including LF USA, a division formed in 2004 to buy and license brands, including Royal Velvet, Cannon and a company that makes Vera Wang clothes for Kohl's (KSS, Fortune 500). The New York-based division now has $1.4 billion in sales, making it a rival to large Seventh Avenue manufacturers. "The idea was to layer the front end of design over the back end of sourcing," says Rick Darling, the division's president. It's as if Intel, in addition to supplying Dell and HP with chips, started making computers. Li & Fung says it keeps the various business lines straight by creating separate divisions for each large customer. At last count, there were 180 such divisions, each headed by a manager, known internally as a "Little John Wayne." Victor coined the phrase to convey a sense of cowboy-like freedom. These managers have wide ranging authority; they can authorize the use of a new factory in Tunisia or open alternative shipping routes -- all without corporate approval. "What they orchestrate is incredibly complex," says Marshall Fisher, a logistics expert at the University of Pennsylvania's Wharton School. "But that complexity has costs." Even the John Waynes of the world occasionally circle the wagons. For all its might, Li & Fung was not immune to the recession. The company wrote off $27 million in bad debt last year, more than a fivefold increase over 2007, mostly related to the bankruptcies of three clients, Mervyn's, KB Toys and Goodie's. Sales for the first six months of the year declined 2% to $6 billion, although profit jumped 13% to $180 million, mostly on cost cuts that include smaller travel budgets and the elimination of 766 jobs, or about 6% of its workforce. Meanwhile, not all of Li & Fung's acquisitions look like winners. In 2006, Li & Fung bought the sourcing operations of Karstadt, a German department store chain, whose parent company filed for insolvency in June. "I'm worried about the health of some of the businesses they bought," says J.P. Morgan's Sharma. To stay lean, Li & Fung is continually on the prowl for new, low-cost factories. Its current focus: sub-Saharan Africa, which, with a vast, inexpensive labor force and duty-free status, holds the potential to rival China as a low-cost producer. "It's a very good strategy for them," says Vijay Mahajan, an emerging economies specialist at the University of Texas at Austin. Consider that a T-shirt made in China automatically carries a 21% import tax. No such tax applies to goods made in 37 sub-Saharan nations, thanks to a trade agreement that runs through 2015. Lured by these lower costs, Asian industrialists are opening factories in the region, and they are tackling Africa's spotty infrastructure by building their own roads and generators, which makes it easier for Li & Fung to transport all those T-shirts and other goods from the factories to the ports. The path forward is full of opportunities but also risks. Luckily for the Fungs, their ancestors are watching.